It shows up once a month in several million mailboxes and many, many doctors’ and dentists’ waiting rooms. I worked at Guideposts and its sister magazine, Angels On Earth, for a little under nine years, and during that time I came to the conclusion that when you really got down to it, all spiritual matters boiled down to one question. Either there is, or there isn’t, a spiritual world out beyond the borders of the material. If there is, then all kinds of questions can be asked, and all kinds of discussions can take place. If there isn’t such a world out beyond the borders of the physical, then it doesn’t matter if a spiritual book or magazine is highly complex and esoteric or written so that the average soccer mom can read it while in the car pool line. Either way, the writers of both kinds of books and magazines are just sadly deluded dupes, because the world they’re talking about, and all the concerns that go with it, simply don’t exist. Either the spiritual world is real, or it isn’t. The rest is really all just footnotes. or vast and terrifying. It can soothe and relax one person, and drive another one slowly mad. But either way, it’s the same ocean. You can TALK about that ocean in a thousand different ways too – ways profound and perceptive or superficial and silly. But the only really silly thing to say about that ocean – the only totally unworkable thing – is to suggest that it doesn’t exist at all. I also wrote a lot of animal pieces at Guideposts and Angels, sometimes in my own voice and sometimes in the voice of other narrators. These pieces very often turned around the death of the animal in question, and when they did they would take me back to a concern I thought about a lot when I was younger, mostly during my early teenage years. What happened to an animal’s soul at death? The question stayed with me over the years, and I would often take special note, once I started reading books about myth and religion, of what this or that author said about the souls of animals – whether they had them or not, and what happened to them, in the long run, if they did. I eventually wrote a piece for Guideposts on this topic called “Will My Pet Go to Heaven?” The piece was – as its title suggests – decidedly on the un-esoteric side, but I was pleased to be working at a place where I was actually allowed to write an article on such a topic at all. I didn’t much see this happening for me had I ended up at, say, Esquire or GQ. But the real question about animals I got interested in while working at Guideposts and Angels was slightly different from whether they had souls or not – though it was related to it. The question was a perfect example of one of those spiritual issues that can seem either idiotically simple or stunningly complex and profound, depending on how you approach it. The question was this: if there was any truth to the central Christian fact – the Incarnation – then didn’t that mean that Christ should be present every time an animal died? I’d seen plenty of animals die, and had always thought there was something irreducibly mysterious and – one could even say – sacred going on when they did so. A stupid idea? Maybe. But it also struck me as the kind of idea that wasn’t stupid at all, but rather simply so difficult to talk about that only really courageous, or foolhardy, authors had ever chosen to do so. I hinted at the idea in my Guideposts piece, but it was so farfetched – so “out there,” as my father’s new age friends liked to say — that I could only include it peripherally. clean, generic place. One that, as Archie Bunker famously said long ago, can’t possibly have any dogs or flies in it, because who wants to go to heaven if it’s full of dogs and flies? But regardless of whether the responses were positive or negative, the article showed me that however one felt about it, the subject of whether animals had souls or not was one that people definitely gravitated to. One day at Guideposts a new guy in the book department named Jonathan Merkh came into my office and asked me what I was working on, book-wise. It was true. The job of ghostwriting Guideposts stories sapped most of my energy, and other than noodling away at small pieces of personal prose in the morning sometimes, I wasn’t capable of much outside work. Path, and told me I should meet up with her and discuss a new one. I turned the idea around in my head, and when Gail came to New York the next time, we did meet. Did I have anything marketable I’d been working on at the magazine, she wanted to know? There was, I told her, this one piece I’d done… on whether animals had souls or not. “I can sell that,” Gail said, and before long I was working on The Divine Life of Animals. Whether Crown Books, the publisher that ended up buying the proposal, wanted it or not, I ended up bringing in that whole question of the presence of Christ at the death of every animal in considerable depth in the book, in what I hoped was at least a reasonably intelligent way. This entailed, it turned out, looking at Christianity itself in what Mircea Eliade used to call a cosmic context. Not cosmic in the superficial, hippy-ish sense that the term has taken on since the sixties, but in the sense of seeing Christ’s incarnation as a genuinely universal event – one which occurred within the context of the entire history of the planet and every being on it. Whether one was a Christian or not, one could see the wisdom of the idea of a presence accompanying the death of every animal rather easily, I discovered, simply by looking at the early history and pre-history of religion, where a figure (who I called the Master of Animals) shows up with tremendous frequency, guiding the souls of animals from earth to the lands below and/or above it at the time of their death. While writing the book I also found myself thinking – as usual – about the paradise myth, and about how animals fit into that universal narrative of humanity’s fall out of its original condition of unity, and its long hard journey back to it. 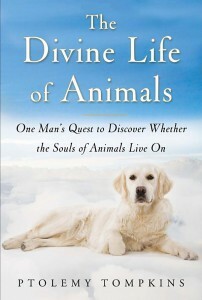 I tried writing The Divine Life of Animals while staying at Guideposts but soon realized I wasn’t up to the task. So, after nine years, I quit my job there to work on it full time. Whatever its strengths or weaknesses, The Divine Life of Animals is, I think, a book that I’d never have been able to write had I not worked at Guideposts and Angels. Not just because my time there allowed me to stumble upon the key questions the book is built around, but because I also developed the courage, while there, to care even less about whether people were critical of my ideas or not. In the world of spiritual writing, worrying too much about this question is, I think, even more damaging than it can be in other genres. Sounding silly to a lot of people is just part of the price of admission.